If you need a more efficient form of heating and cooling for your home then Closewood can help you reduce costs and improve the ambience with systems that can be controlled from your smartphone or tablet. Every home is different and at Closewood not only do we ensure that your heating and cooling needs are taken into consideration, but that the installation causes minimal disruption to the home and is as ‘invisible’ as possible. Once our survey is complete you will receive details about the costs, installation time scales and process and how much you can expect to save within a specified period of time. Our staff are efficient, courteous and trained on the latest technologies. The project will be managed by one person making it easy to have a point-of-contact. Your privacy will be respected at all times and minimal disruption will be caused to any existing decorations or fittings. In most domestic situations the typical solution is a heat pump, however if there is a better, more efficient way of heating and cooling your home, the survey and report will explain how we have approached the project, our findings and benefits. Along with the cost of the project and timetable of work, the survey will also include details of the pipe routes we’re going to take within your home and how we will conceal the piping. Closewood employees take pride in their work, and we prefer that trunking and pipework remain as hidden as possible. The survey will also include the payback period – the time it takes for the system to pay for itself from the savings. This period of time is calculated and made using an existing running cost calculation, against a running cost calculation for new equipment. Another aspect considered is heat gain and heat loss. Not only is room space measured but also the number of windows, which direction the room is facing and the type of insulation you have. We’ll always advise you where improvements can be made before installing the unit. Controls are one of the main factors when it comes to reducing your running costs – why should you heat or cool rooms that are not being used? Current technology now allows you to switch the heating and cooling system on remotely using a smartphone, PC or tablet directly from the office, supermarket or the sofa. You can activate your system just before you return home, or go upstairs: imagine having the ability to warm up two bedrooms but not the spare room just before going to sleep. The use of heat pumps is making domestic heating and cooling much more efficient, cost effective and giving respectable payback times. Until recently it was mainly large residential dwellings and high-end market properties that were benefiting from having heat pump systems installed. 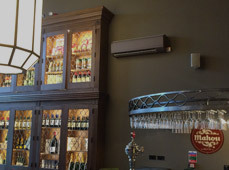 However, improvements in the current technology, along with wider use, is allowing for the use of heat pumps by local authorities and housing associations who are installing these in standard houses and Closewood are helping to bridge the gap between the larger dwellings and more affordable properties. A heat pump is a piece of equipment that will take the energy from outside and utilise it within the property. Even if it’s -1 degrees centigrade, there’s still hot air within the outside temperature that can be extracted. This exchange only requires a small amount of electricity to make it work and is much more efficient than a gas or electric boiler. For every 1 kilowatts of energy used to run a heat pump you will generate approximately 3 kilowatts of energy. Meanwhile the gas boiler owners have to pay for a therm of gas, which comes through the boiler and goes to the radiator. By the time it reaches your radiator the therm has gone due to loss of heat through the pipework – you are not receiving what you pay for at the point of delivery i.e the radiator. What kind of savings can customers make? This will be dependant on the client’s existing domestic system, insulation and typical use. Is there a great deal of disruption for the client? The installation of a Closewood system causes less disruption than the traditional installation of a central heating system. Where practical you will not see any pipework inside the property and any going up the building, into the eaves of the house, will typically be encased in down pipe. 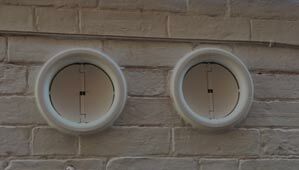 Visitors will only be able to see very little, if any pipework. However, there might be an application where you may need to show pipework. All of this is explained before installation and where possible amendments will be made to make it aesthetically pleasing. Does it need servicing and what happens if it breaks down? The systems Closewood install do need servicing and we recommend twice per year. However, this may be cut back to once a year depending upon the amount of usage. Should the system breakdown it is a very similar situation to the breakdown of a gas boiler, you have to phone an engineer and ask them for assistance. If the system is critical then service level agreements can be arranged to cope with any eventuality.